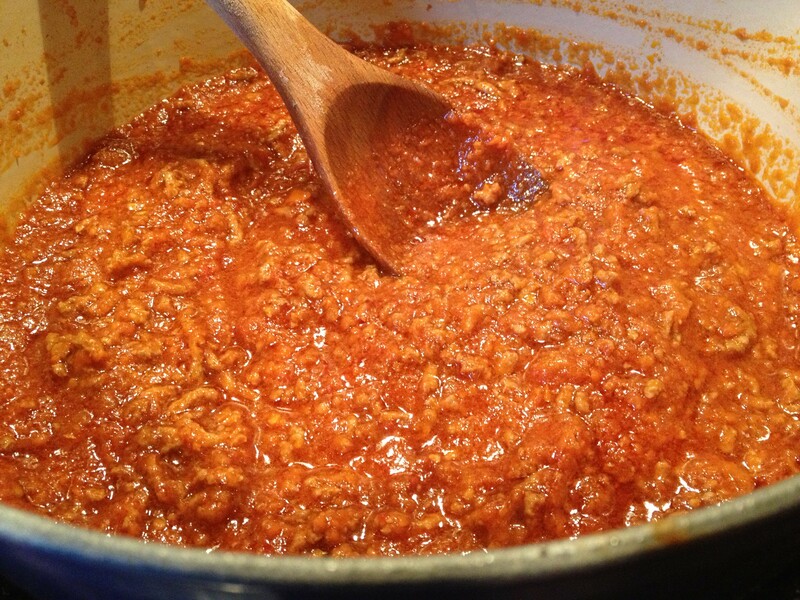 There are as many recipes for ragu alla Bolognese as there are Italian Nonnas making them. For years, I did an adequate job with this sauce, but I always felt it was lacking a certain je ne sais quois (oops, wrong country). Then I read and reviewed Luisa Weiss’s book My Berlin Kitchen (wrong country again!) and tweaked my technique just enough to say with confidence that I’ve finally mastered this. This is not Luisa’s recipe (and I’m only being clear about that since lately I’ve wound up with a lot of traffic from people who were searching for that recipe online); I have added garlic and crushed red pepper, as well as subtracted some of the meat. The spirit is the same, but the details are different. I do think it’s important to spring for canned whole San Marzano tomatoes (assuming you don’t have tomatoes plucked fresh from your garden, that is). One thing Luisa did drill in my head, however, is that the ultimate secret ingredient in this sauce is time. If you can start this before 11:00 am, you will have a happy family come dinner time. In a food processor, finely chop onions, carrots and garlic clove. In a heavy sauce pan, such as the awesome Le Creuset your mom got you for Christmas last year that you love so much it hurts, melt the butter and olive oil. Add chopped carrots, onion and garlic and cook on medium high for about six minutes, until softened. Add the ground meat and cook for about ten minutes, until it is no longer pink and most of the liquid is cooked out. Add wine, and simmer for about five minutes. Add pureed tomatoes, salt, and crushed red pepper. Once bubbling, reduce heat to lowest setting, cover, and go on with your life. Every so often, give it a good stir. Let simmer between five and seven hours. Serve with favorite pasta and a nice glass of chianti. This entry was posted in Main Dish, Sauces and tagged best pasta sauce, meat sauce, ragu alla bolognese by Mom Mom's Apron. Bookmark the permalink. That looks like a great bolognese sauce, Dawn. I love the addition of a bit of butter.